SAN FRANCISCO (CN) – The California Supreme Court on Wednesday refused to let the city of Oakland out of a sprawling civil lawsuit brought by victims of the Ghost Ship fire that killed 36 people two years ago who were attending a dance party in an illegally converted warehouse. “It is a great day for the families of the victims of the Ghost Ship [fire] that the Supreme Court denied the cert and the city is now in the case and will be held accountable,” plaintiffs’ lead liaison attorney Mary Alexander said by phone. The high court’s decision comes after a state appellate court and Alameda County Superior Court Judge Brad Seligman both refused to dismiss the case against Oakland, which includes Pacific Gas & Electric as a defendant. Seligman twice rebuffed Oakland’s bid to dismiss the claims, concluding in a pair of rulings that the city may be partly responsible for the Fruitvale-area fire. 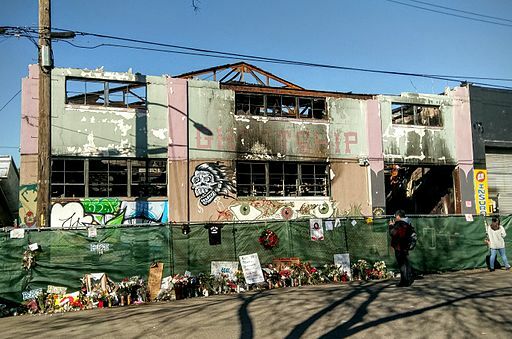 In those rulings, issued in December 2017 and May 2018, Seligman found the city was required to inspect and shut down the Ghost Ship after fire, police and planning and building department employees learned it was unsafe, and that it was not immune from liability for failing to do so. Among the suits’ roughly 20 defendants are the Ghost Ship’s owner, Chor Ng, master tenant Derick Almena, and creative director Max Harris. Almena and Harris face 36 counts each of involuntary manslaughter in separate criminal proceedings. The plaintiffs claim Oakland neglected to inspect and shut down the Ghost Ship – which had been illegally converted into a live-work space for about 25 artists – for not being up to code, though police and fire personnel visited repeatedly before the fire, and the planning and building department received multiple reports of dangerous conditions there. According to the plaintiffs, the warehouse was cluttered with flammable materials and debris; received its power from an adjacent building via an overloaded cable snaked through a hole in the wall; lacked overhead sprinklers and emergency exits and had only two rickety stairwells, one of which had been blocked off before the Dec. 2, 2016 party. Seligman also refused to dismiss PG&E from the suit, finding in September 2017 that its failure to install a separate electrical meter on the Ghost Ship may make the utility also partly to blame. The suit accuses PG&E of failing to install a sub-meter on the Ghost Ship and two adjoining buildings, and of not monitoring the flow of power to the buildings through the single meter that had been installed next door. Had PG&E monitored the flow of power, the plaintiffs say, it would have noticed the dangerous power surges caused by overloaded electrical lines supplying the Ghost Ship. That would have triggered an inspection and termination of service before the fire happened. Although the complaint doesn’t identify what started the fire, it suggests the overloaded lines did it. Federal investigators were unable to pinpoint a cause. A spokesman for the city had no immediate comment Wednesday evening.